A poignant story of one college student's romantic coming-of-age,Norwegian Wood takes us to that distant place of a young man's first, hopeless, and heroic love. There is a lot to be said about Norwegian Wood. It’s a coming of age story, or to use the pretentious new word I’ve learned, a bildungsroman. Norwegian Wood is apparently Murakami’s most popular novel, even though it is extremely different to his other novels. The narrative follows Toru Watanabe through his first years of university as he learns about the nature of life and death. 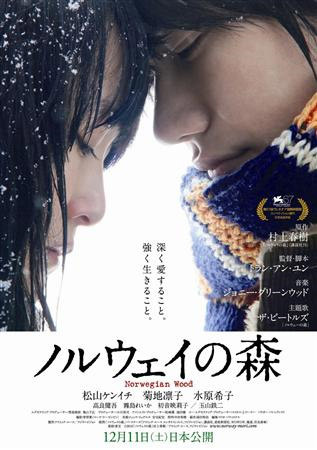 Norwegian Wood is permeated by a sense of loneliness and alienation. Our protagonist, Watanabe, embodies this loneliness. I found Watanabe to be kind of an annoying character to begin with, his defining feature is his loneliness and isolation from those around him. He is, in my opinion, a terribly dull character. But Watanabe is like this for a good reason, and his nature serves an extremely plot and symbolic point. So as boring as I found Watanabe, maybe he was just representative of a more normal person, instead of the caricatures we sometimes find in novels. The more I read of this book, the more I thought of it as an older, darker, harsher, more graphic version of a John Green novel. It reminded me so much of Green’s first novel, Looking for Alaska, it almost seemed to a darker version for older young adults. Don’t feel like I’ve spoiled it for you , the plot of Norwegian Wood is nothing like that of Looking for Alaska, but there were definitely some parallels. The characters of Watanabe and Midori are extremely like Pudge and Alaska. The arc and tone of the story was quite similar, and just like Pudge, throughout the novel Watanabe comes to understand the nature of life and death. ( Just to let you know , I loved Looking for Alaska , so I did not mind reading another book I found similar to it. The similarities aren’t bad, I just wanted to point them. Also, I’m pretty sure Norwegian Wood was written first, so if anyone is copying, it’s Green. )As I’ve mentioned before, this novel is surprisingly dark. Murakami deals with suicide and mental illness in his novel, and no holds are barred. The characters, for the most part, are fairly realistic. Naoko, Watanabe’s best friends ex-girlfriend seems to be a rather quiet, rather lost character. Nagasawa, Watanabe’s friend, is an intellectual player who is unable to commit. Reiko, Naoko’s middle aged roommate, is probably the oddest of the characters, while still managing to be realistic. Midori, on the other hand, seemed to be one of those cliched whirlwind, crazy girls that you rarely meet in real life. Overall this was a really good book. I didn’t love it like everyone else seemed to , but I did really really like it. I would recommended it to anyone who wants to make a step up from ordinary YA novels.